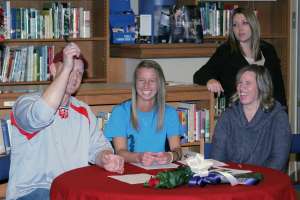 Taylor High School continues its successful run of helping student-athletes move to the next level as Athletic Director Karen Franklin directed signing ceremonies for two more Titans. Kelsey Gordon and Caitlyn Arnold have accepted scholarships to Oakland City University to play NCAA Division II softball. Arnold also happens to be the daughter of Taylor head softball coach Shane Arnold. With a season of softball still left at Taylor, both athletes have left their marks on the Lady Titans program – and both were named to the Kokomo Perspective/Howard County Coaches All-County Softball Team. Gordon is dominant on the mound as she finished last season 13-4 with a 1.90 earned run average. Her best friend hit .467 and knocked home 12 RBI’s during a sensational junior season. Gordon said she fell in love with Oakland City from the first time she visited. Despite being best friends, Gordon said she and Arnold will not room together on the OCU campus. As for Arnold, she wasn’t sure softball would be in her future when she gazed into the crystal ball years ago – but she sure dreamed about it. But now the signing is behind her and she has her college future secure; the senior knows that she cannot let up on her hard work and dreams. “I am in awe right now, this is just, well, big,” said Arnold, who blistered the base paths and scored 26 runs a year ago. “It is a relief that it is over (the signing), but there is still a lot of hard work left; I am not stopping now. Coach Arnold beams when he talks about the Taylor softball program. And while he will coach his daughter for one final season, he says the entire program is full of Arnold’s and Gordon’s and the future is bright. Oakland City is located north of Evansville and has a strong softball history. Along with playing at the NCAA DII level, they also participate in the National Christian College Athletic Association. The Lady Oaks were NCCAA Division I national runners-up in 1997. This entry was posted in High School, Kokomo, Lady Titans, Oakland City University, softball, Taylor. Bookmark the permalink.